All right. I know. Saying that an increase in pedestrian deaths in traffic accidents is proof of our stupidity is a cold thing to say and I should show compassion. And if your loved one was an innocent pedestrian killed in a traffic accident, my deepest condolences. With that being said, if you are one of the masses who buries his or her face in a smartphone and you get hit by a car as a result, perhaps it’s time to look up and walk. Let’s be real. A lot of us do it. But if we have to start warning people about distracted walking…maybe we just…shouldn’t. According to the article pedestrian deaths are up 11 percent or about 620 people from the year previous. 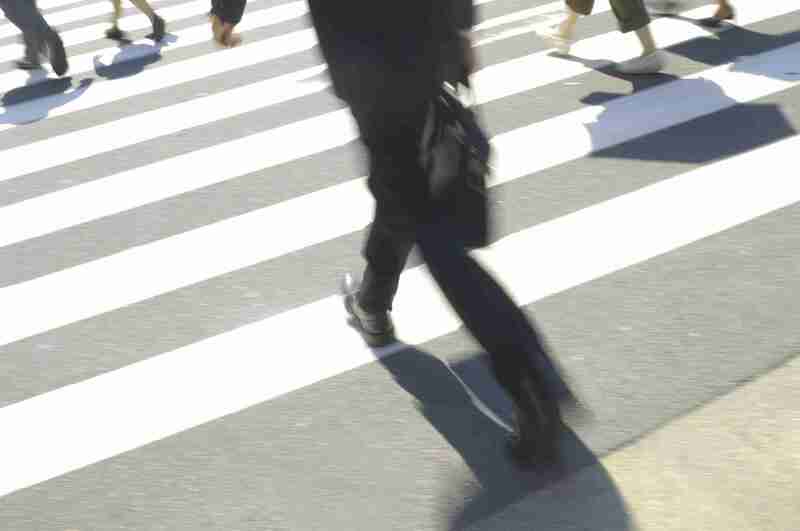 And what’s more, pedestrian deaths have been a growing trend in the last few years. Why the uptick? Well, the article proposes that with better fuel economy maybe we are driving more, or that we are walking more to be health and environmentally conscious, and any time you increase your activity you increase your risk of injury or accident, or perhaps people are walking around drunk—no, really, 34 percent of pedestrians killed were intoxicated. But in actuality—though difficult to prove—the killer is smartphones and distracted walking. This makes the most sense. Remember when smartphones first came on the scene around 2008-2009 and a rash of articles about teens getting hurt because they were too busy texting or whatever and didn’t notice curbs or open manholes? The kids who did that then are adults now and the smart phone has become ubiquitous. And it isn’t just kids. Adults do it all the time, face in smartphone oblivious to the world. So of course, if you are walking and smartphoning, you run the risk of getting killed. But there is a slight wrinkle in the article. The executive director of the governors safety association—the organization the study was conducted for—says we aren’t doing enough to protect our pedestrians. What else can we do? Wear bubble suits to protect ourselves from our own stupidity? I’m sorry, but at what point do we recognize our own culpability in the things that are dangerous for us? We need to protect our pedestrians? What are we a spotted owl or Bengal tiger now? No. We aren’t. We are humans, capable of thought and taking responsibility for our actions. Of course, if we don’t pay attention we may very well become an endangered species, no thanks to ourselves. Well, this is interesting don’t you think: http://jalopnik.com/the-dodge-challenger-srt-demon-has-an-insane-cooling-sy-1793813873? The scorching Dodge Demon will cool itself with its own air conditioner. According to the article, this will be the first production car to use the air conditioner as a cooling mechanism. Really, this means, the big beast will be even bigger and beastier since cooler denser air will give even more power to the Demon. This should be one fun ride, eh?